Scientists have long known that isolation is a killer of nature. Organisms must be connected to others of their species – to maintain viable populations. Such connectivity allows species to limit inbreeding, maintain genetic diversity, withstand random demographic fluctuations, and recolonize areas from which they have gone locally extinct. Many species also rely on annual migrations – for example, to move between distant wintering and breeding areas. Finally, for many millions of years, species have moved in response to climate change, such as the Ice Ages, shifting to higher or lower latitudes or elevations. “Move or die” has seemingly been their motto (although a few species could adapt rapidly enough to survive changing climates). But despite the undisputed importance of movement and population connectivity, habitat fragmentation is continuing apace throughout the world. And many of the world’s great animal migrations have collapsed or are rapidly declining. Among the usual suspects in fragmenting our planet – habitat destruction, roads, sprawling urban areas, to name a few – is an old nemesis that many had underestimated. Scientists are increasingly seeing fences as a big problem, especially for many large mammals, flightless birds, and low-flying species that fail to see fences in their path. Researcher Penny van Oosterzee reported recently that Africa once supported 14 major large-mammal migrations, but five have failed completely and the remainder all are in trouble. Fences are a big part of the problem. For example, Botswana, a Spain-sized nation in southern Africa, today has over 5,000 kilometers of fences just for cattle ranching. 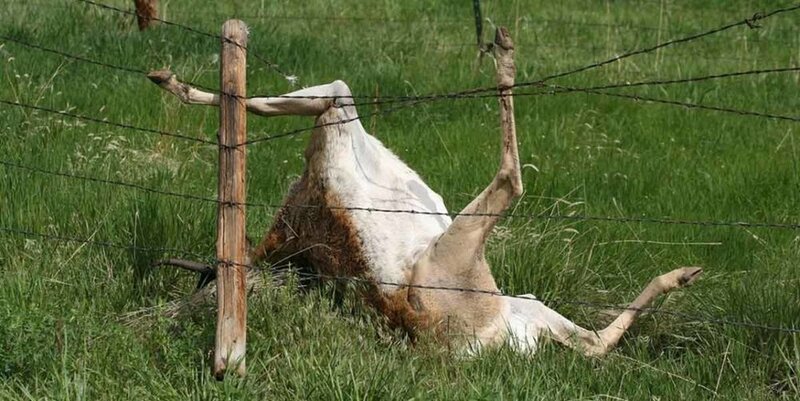 Those fences don’t just stop cattle – they also halt big mammals such as Wildebeest, Hartebeest, and Zebras. The fences become especially problematic, according to van Oosterzee, when droughts hit and the wildlife would normally migrate to wetter areas. Following droughts, even quick surveys have revealed hundreds of thousands of dead animals along the fences. As their prey have declined, predators such as Lions, Leopards, Cheetahs, Hyenas, and African Wild Dogs have also suffered serious population losses. And Africa is far from alone. Elsewhere in the world – such as North America, Indochina, Borneo, Australia, and Central Asia – great wildlife migrations have collapsed or are dwindling dramatically. Fences are just one part of a much broader ‘human footprint’, but their ecological impacts are almost certainly underestimated. We know that in areas with a heavy human footprint, movements of individual wildlife decline by half to two-thirds, on average. 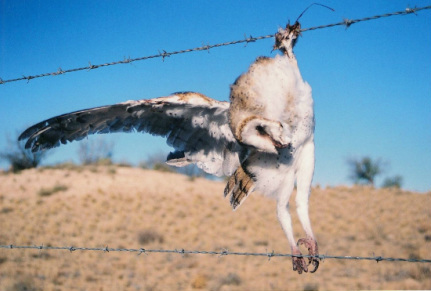 But how much of that choking effect on wildlife movements is being caused by rapidly expanding fences? We can say ‘a lot’ – but not much beyond this. The good news is that international bodies – such as the Convention on Biological Diversity, the Connectivity Conservation Specialist Group, and the Intergovernmental Science-Policy Platform on Biodiversity and Ecosystem Services – are increasingly emphasizing the critical importance of maintaining ecological connectivity in the real world. And with the global explosion of the human populace and our environmental footprint, such efforts are coming not a moment too soon. As we focus more on connectivity, we can’t ignore the many millions of kilometers of fences on Earth – and their burgeoning impacts on larger animals, whose roles in ecosystems are often profound. It’s time to take a hard look at fatal fences – and realize how often they are shattering and strangling nature. ALERT member James Watson, a leading conservation biologist, tells us about his hot-off-the-press research and its alarming messages for nature conservation. In our recent research on the "global human footprint," we discovered that over half of the world's land area has been completely converted to human-dominated land-uses. And now we have added to this finding with another alarming discovery, in a paper just published in Conservation Letters: habitat degradation varies hugely across Earth's major ecosystem types. For example, chilly tundra environments have been only slightly modified, whereas others, such as mangrove forests and subtropical forests, have been decimated, with over 90 percent destroyed for human uses. Lots of Ecoregions are in trouble. Our new study reveals that, since 1992, when the landmark Convention on Biological Diversity was ratified, an additional 450 million hectares of nature habitat -- an area two-thirds the size of Australia -- has been destroyed by human land-uses. Much of this loss occurred in regions that had already suffered considerable habitat destruction. We found that almost half of the world’s 800 Ecoregions -- places with distinctive animal and plant communities -- should be classified at "very high risk," with destruction of the Ecoregion being 25 times greater in extent than existing protected areas. And 41 Ecoregions are in "crisis" -- losing habitat so rapidly that there is little left to protect. Crisis Ecoregions are concentrated in the Asia-Pacific region (Indonesia and Papua New Guinea) and Africa (Madagascar, Democratic Republic of Congo, and Angola). The best tool that nations have at their disposal to combat habitat loss, alongside strict land-use planning and regulation, is the creation of large, well-connected protected areas, especially in places that are at risk of future destruction. What is arguably our most worrying finding is that many developed countries, such as the U.S., Australia, and Canada, have worsening ratios of habitat loss and protection in many of their Ecoregions. Among industrial nations, Australia is the worst performer of all, with habitat conversion greatly outpacing protection in 20 of its most biologically rich Ecoregions. Our findings are a giant red flag. It is now time for all nations to undertake a full and frank assessment of how their efforts to protect nature and conserve rare ecosystems are progressing. ALERT welcomes to its ranks Jeremy Hance, an accomplished environmental journalist. ALERT is growing rapidly -- now reaching around 100,000 people worldwide each week -- and Jeremy will be making periodic contributions to help us cover highly topical conservation news and research findings. Here, Jeremy tells us about an important new study that highlights the vital role of protected areas for conserving biodiversity. In a world of rising human population and increasing demand for natural resources, it’s challenging to make the case for designating more protected areas or for supporting more rigorous protection of such areas if we can’t prove that parks are actually working to protect wildlife and other species. This is why a recent study in Nature Communications, led by Claudia Gray from the University of Sussex, UK, is so important. It gives conservationists a new weapon in their arsenal -- by finding that nature really is doing better inside parks than outside. Gray and her colleagues found that sites inside protected areas had 11 percent more species than did unprotected sites. Moreover, parks had 15 percent more individuals than did areas outside the parks. At first blush, the findings don't seem all that surprising. Conservationists have long believed that parks are important for harboring biodiversity, and a few earlier studies have come to similar conclusions. But the research of Gray and her colleagues stands apart for its remarkably breadth and rigor. Using a database called PREDICTS, Gray and her team were able to look at surveys of 13,699 species of vertebrates (amphibians, reptiles, birds, and mammals) as well as invertebrates (insects, spiders, and the like) and plant species. The scope of their study was massive: they examined species trends across 1,939 sites inside 359 different protected areas. They compared these findings with species data from a staggering 4,592 sites outside of protected areas. The study by Gray and colleagues is utilizing big data at its best. PREDICTS -- which stands for Projecting Responses of Ecological Diversity In Changing Terrestrial Systems -- collects data from published research as well as scientists working on the ground, to assess how biodiversity is changing at local levels. The Gray study also controlled for various factors that might influence local biodiversity, such as the elevation, slope, and agriculture suitability of each site. Digging deeper, Gray and her team found that there was little difference between protected and unprotected areas in little-impacted primary or secondary forests -- meaning that so long as an area remains left alone by humans it retains much of its biodiversity. But protected areas set aside in agricultural or plantation regions had significantly higher biodiversity than did the surrounding countryside, especially in the tropics. However, Gray and her team found that protected areas don’t do everything. For example, parks didn’t show increased ecological niches for biodiversity. Rather, their greater biodiversity simply arose because they maintain larger populations of species. Parks also did not harbor many more endemic species than did unprotected areas -- something that surprised the researchers. But overall, parks still did a lot better than human-dominated lands when it comes to protecting nature. More Parks or Better Parks? Currently, around 15 percent of Earth's land area is set aside as protected areas. But the Convention on Biological Diversity has pledged to raise this figure to 17 percent by 2020. However, Gray and her colleagues argue that simply increasing the number and extent of parks may not be the best way forward. Instead, they suggest, it may be better to increase protection of already-established parks -- though they hasten to add that more data are needed before confident recommendations can be made. Whatever the way forward, the study by Gray and her colleagues means it will be just a little bit easier to justify protected areas than it was before. They're not perfect, but by and large, parks are working much better than unprotected areas to conserve Earth's imperiled biodiversity. On the eve of the World Parks Congress in Sydney, Australia, ALERT member James Watson tells us about a hugely important paper he and colleagues published this week in the world-leading journal Nature. Ten years have passed since the last IUCN global conference on protected areas. During this time we've seen tens of thousands of new protected areas established on land and in the sea. Unfortunately, at the same time, protected-area support has fallen off dramatically, with an estimated 80% of such sites now being ineffectively managed. It’s a massive shame. When well administered, protected areas get results. There is abundant evidence that protected areas, when well managed, protect threatened species and often store large quantities of carbon while delivering key ecosystem services, such as clean water and buffering against extreme weather. Nevertheless, we show today in a paper in Nature that, while many nations talk the talk on protected-area creation, they often fail to walk the walk when it comes to ensuring these areas have adequate resources and oversight. If the nations of the world continue to follow a business-as-usual approach, the broad targets set under the vital Convention on Biological Diversity won't be achieved. A fundamental step-change is needed to align government policies so that Ministries dealing with development, resource extraction, and agriculture don't undermine those concerned with environment and conservation. At the same time, there's an urgent need to invest in protected areas to ensure their vital goals are achieved, and to identify new protected areas critical to nature conservation -- areas that can be established and maintained with care and imagination. Achieving these goals on our increasingly crowded planet will not be easy. A nation's progress should be measured not merely by the amount of land it protects, but also by the ecological connectivity of its protected lands and their capacity to sustain biodiversity while producing long-term social and economic benefits. It's a massive challenge, but failure is not an option. We must succeed -- for the future of nature and for our future as well. DESPERATE. That's about the only word that could describe the last-ditch efforts of Australian green groups to slow the Tony Abbott government's relentless march to push business and development interests, no matter the environmental cost. Having had no luck at all in influencing the Abbott government, a coalition of Australian environmental groups are now imploring the Secretariat of the Convention on Biological Diversity -- a longstanding global accord to which Australia is a signatory --- to censure the government for its anti-environmental ways. Specifically, the green groups want the CBD to slam the Abbott government's scheme for a so-called 'one-stop shop' -- a greatly simplified way to approve environmentally risky projects by devolving responsibility to the individual Australian states, where pro-development interests usually have more sway. it's a formula for disaster, say conservationists, especially given the conservative nature of many Australian state governments right now. Such measures are likely to lead to lower environmental standards, conflicted decision-making, and ultimately a loss of biodiversity -- all of which are contrary to Australia's commitments under the CBD, say conservationists. Having exhausted virtually every possible avenue within Australia, conservationists are now being forced to look abroad for help. It's a sign of the times and -- as summarized in this excellent essay by ALERT member Corey Bradshaw on his ConservationBytes site -- a telling indication of just how bad things have gotten for the Australian environment.